It's hard to believe Hammer Films didn't tackle the subject of Jack the Ripper in any of its horror films until 1971, but suddenly they found themselves mounting two features tied to the famous serial killer. 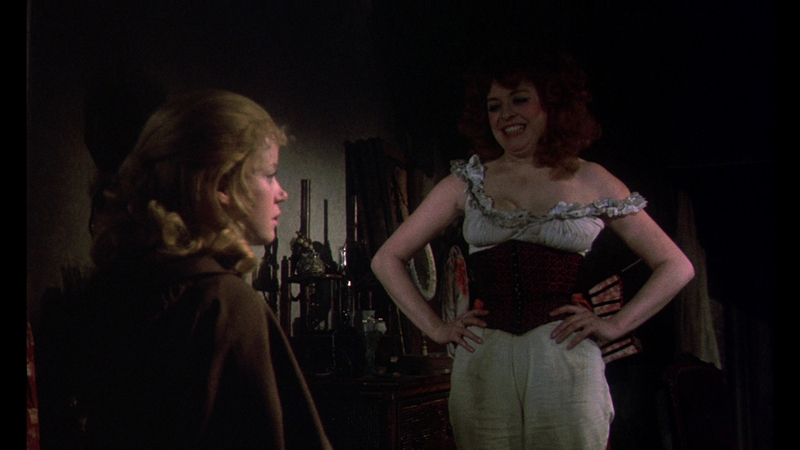 Dr. Jekyll and Sister Hyde managed to wedge the murderer into its gimmicky gender-bending story, but Jack proved far more central to the plot of one of the studio's finest 1970s, Hands of the Ripper. 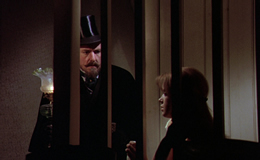 Blending psychological suspense with moments of intense, shocking gore, the film posits the concept that Jack the Ripper, on the verge of being tracked down, left behind a young daughter, Anna, who's permanently scarred by the final memory of her father kissing her against flickering firelight after stabbing her mother to death. Grown into a young woman, Anna (Rees) has fallen into the hands of a phony psychic, Mrs. Golding (Bryan), who isn't above selling Anna's body on the side to wealthy patrons. However, that plan goes out the window when one of the clients triggers Anna's violent side, after which Mrs. Golding winds up skewered to a bedroom door. 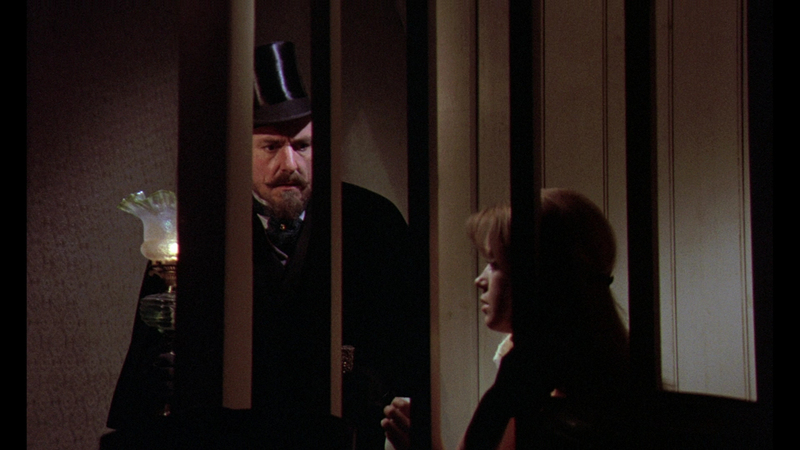 The curious Dr. Pritchard (The Lost Continent's Porter), who was on hand to look into the establishment's practices, is intrigued by the innocent-looking Anna's apparent schizophrenia and bails her out of the local asylum to take her under his wing. Unfortunately, that means several more lives are bound to be cut short. With many of the original stable of Hammer producers and directors heading off for other pastures at the close of the '60s, the studio's output was being widely criticized for its attempts to keep up with the growing demands for sexier, bloodier entertainment. Of course, many of those later criticized films have found their reputations growing dramatically once uncut versions began surfacing on home video; today there's no question that many of these once abused films are more than worthy of standing with the studio's golden era a decade before. 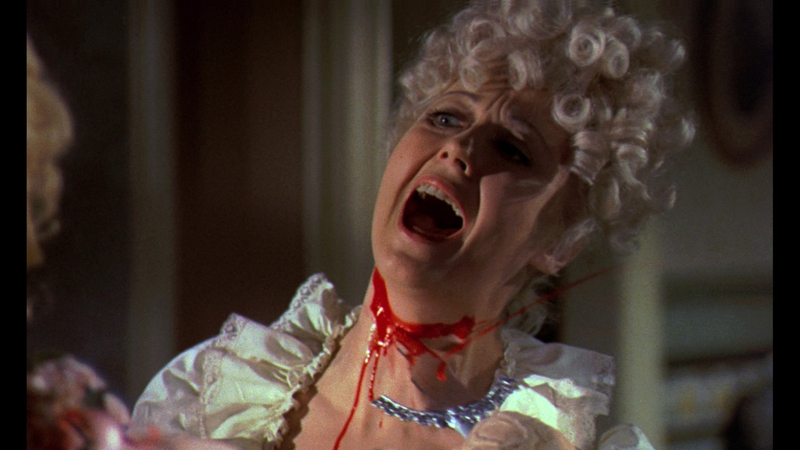 One of the shining lights of this final stretch was director Peter Sasdy, who made his Hammer debut in 1970 with the overachieving Taste the Blood of Dracula (arguably the last genuinely great installment in the series) and followed it with both this film and Countess Dracula the following year. The rest of his career was far more erratic, ranging from excellent fare like TV's The Stone Tape to flawed but intriguing offerings like Nothing but the Night and The Devil within Her. (He also directed The Lonely Lady, but that's another story entirely.) Beautifully shot, acted, and edited, Hands of the Ripper is easily one of his best efforts, with Christopher Gunning (who went on to the long-running Poirot TV series) supporting it with one of Hammer's all-time best music scores. The violence here is still genuinely startling, with one poor maid getting her throat gouged by a broken mirror and a prostitute's face meeting a fistful of hat pins in two of the most memorable scenes. (One report suggests the mirror murder once existed in a slightly longer form, though this has yet to surface via any TV screenings, circulating prints, or home video releases.) However, in a rarity for Hammer at the time, the film also manages to reach a genuinely haunting and poetic climax at St. Paul's, a tragic conclusion involving not a fiery inferno or outraged villagers but a logical conclusion for the two main characters instead. As with the other Rank Organisation Hammer titles like Countess Dracula, Vampire Circus, and Twins of Evil, this film bounced around between several distributors and video labels over the years. Apart from a VHS release in America in the mid-1980s, it's been strangely difficult to see for most U.S. viewers who instead had to turn to a pair of UK DVDs. 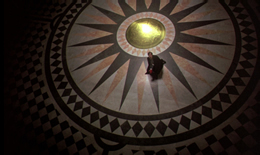 The first from Carlton in 2000 was a no-frills affair with slight trims to two of the gore scenes, while the label switchover to Network inspired a special edition revisit in 2006 containing a good audio commentary with Rees and writers Kim Newman and Stephen Jones as well as the Rees-starring "Once the Killing Starts" episode of Brian Clemens' terrific horror/suspense '70s series, Thriller. The transfer looked fine for the time but was cropped to 1.78:1, with some of the darker scenes turning a bit muddy. The dual-format Blu-Ray and DVD 2013 release from Synapse is easily the most impressive and a worthy companion to their previous Hammer/Rank releases of Vampire Circus and Twins of Evil. The transfer is (finally!) 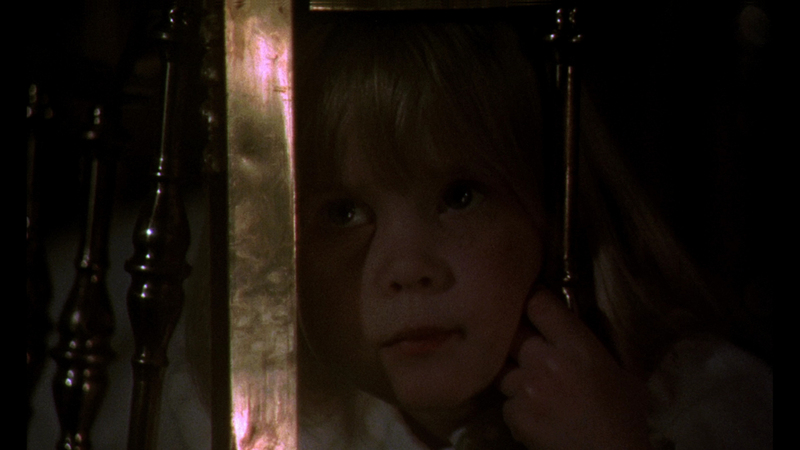 correctly framed at 1.66:1, with the extra headroom giving the film a more spacious and elegant appearance than before. Those pesky dark scenes are also much more legible, which is especially important given how many shots involve moody shadows punctuated by flickering lights. The DTS-HD MA two-channel mono track sounds excellent as well, with a welcome isolated music and effects track added for good measure only on the Blu-Ray. (A nice touch since this score has never had a commercial release.) Optional English subtitles are also provided. Now, on to the extras. Clocking in at 28 minutes, "The Devil's Bloody Plaything: Possessed by Hands of the Ripper" covers the state of Hammer at the time and the production of the film courtesy of interviews with Sasdy, actress Jane Merrow (who discusses the tricks of playing a blind person), Little Shoppe of Horrors publisher Richard Klemensen, Hammer historian Wayne Kinsey, director Joe Dante, writer Kim Newman, and Video Watchdog's Tim Lucas, with brief audio comments from Rees. Another thorough job from Daniel Griffith and Ballyhoo Pictures, it charts the fragmented state of Hammer's productions at the time and the difficulties in finding financing and American distributors, not to mention the censorship obstacles involving the film's graphic violence. 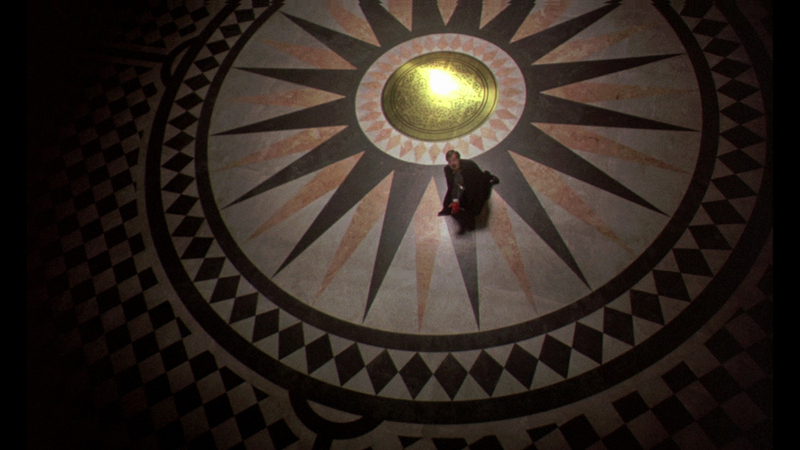 One particularly nifty bit involves the visual trickery used to create the film's Whispering Gallery climax when St. Paul's wouldn't allow filming on the premises, which Sasdy pulled off to magnificent effect. The six-minute "Slaughter of Innocence: The Evolution of Hammer Gore" is basically a gallery with music covering some of the studio's more grisly makeup effects ranging from Curse of Frankenstein to the final Christopher Lee films, and the U.S. trailer and a handful of TV spots are included as well. As with some other Hammer films, this was heavily edited when Universal handed it off for TV broadcast, and new bookend segments with Severn Darden as a psychologist were added to beef up the running time. The video master for this version was apparently destroyed in the big Universal lot fire several years ago, but the audio of it is included here in a nice touch for completists. An essential title for any horror fan and one of the best Hammer releases on Blu-Ray to date. Reviewed on July 6, 2012.